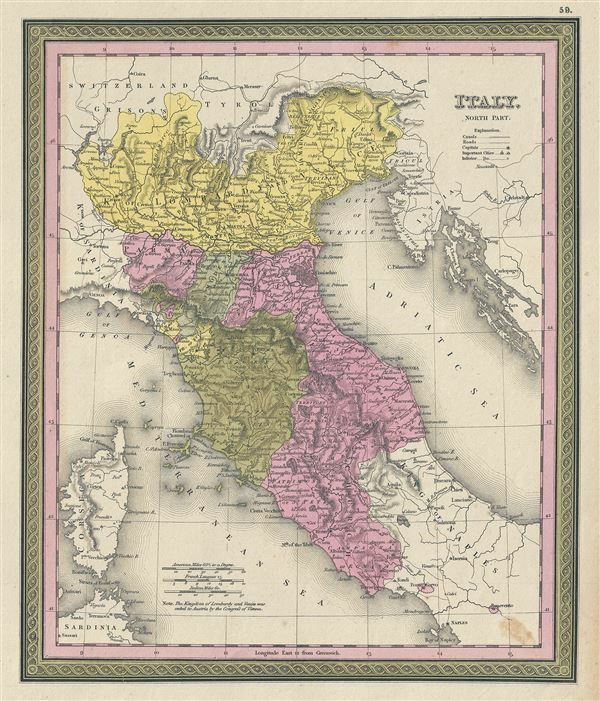 This is a fine example of Thomas Cowperthwait and S. A. Mitchell's 1849 map of the north part of Italy. Centered on Tuscany, this map covers from Lombardy to the Papal States (Including Rome), and the Venetian Republic. The whole is engraved in Mitchell's distinctive style with green border work and vivid pastels. Political and topographical features are noted and color coded with elevation rendered by hachure. As this map was being drawn, Italy was undergoing the process of Risorgimento, where the different city-states of the Italian Peninsula struggled for solidary as a single Italian nation. This map was prepared by S. A. Mitchell for publication by the Philadelphia firm of Thomas Cowperthwait & Co. as plate no. 59 in the 1849 edition of Mitchell's New General Atlas.